Sony PS4 Neo is the new gaming console manufactured and developed by Sony. PS4 Neo is also known PS4.5 OR PS4K. This hardware is developed and manufactured by 3 best companies Sony, Microsoft and Nintendo. The gaming console is capable of upscaling the current PS4 titles to 4K, as well supporting games with improved visual fidelity, a huge benefit for the upcoming PlayStation VR headset. The NEO features a higher clock speed as compared to the original PS4 with improved GPU and higher bandwidth on the memory. 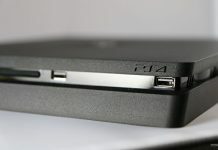 New has HDD as that in the Sony’s original PlayStation 4, but that means in terms of capacity or connection speed. 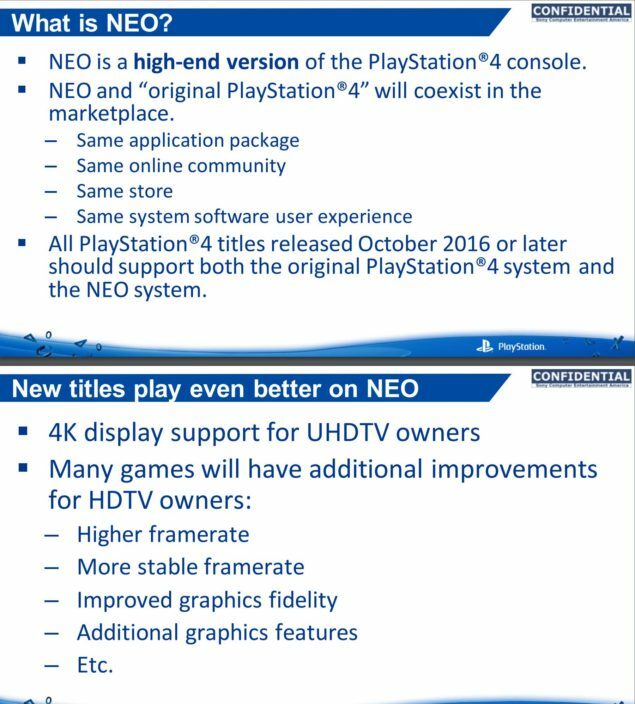 Look out the difference between PS4 and Neo. All games that are running in NEO mode is able to use all hardware upgrades (and an additional 512 MiB in the memory budget). This is to offer more stable frame rate with higher visual fidelity, at least when those games run at 1080p on HDTVs. 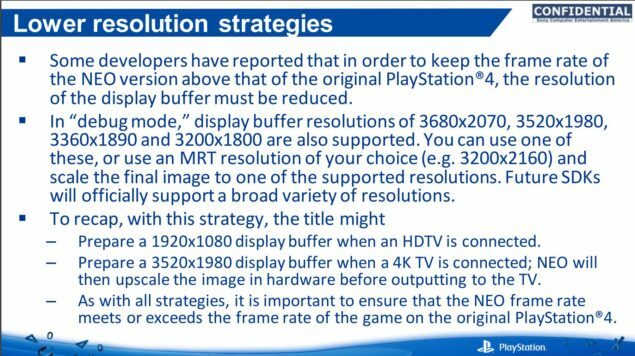 The NEO also supports 4K image output, but games themselves are not required to be 4K native. 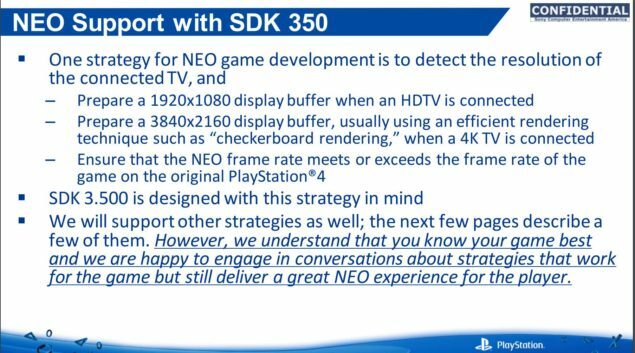 The NEO does not replace the current PS4, but exists side by side and also support user environment same as PS4. PSN store is also same for both PS4 and PS4 Neo, both connect to same communities present online and also offers same user experience. 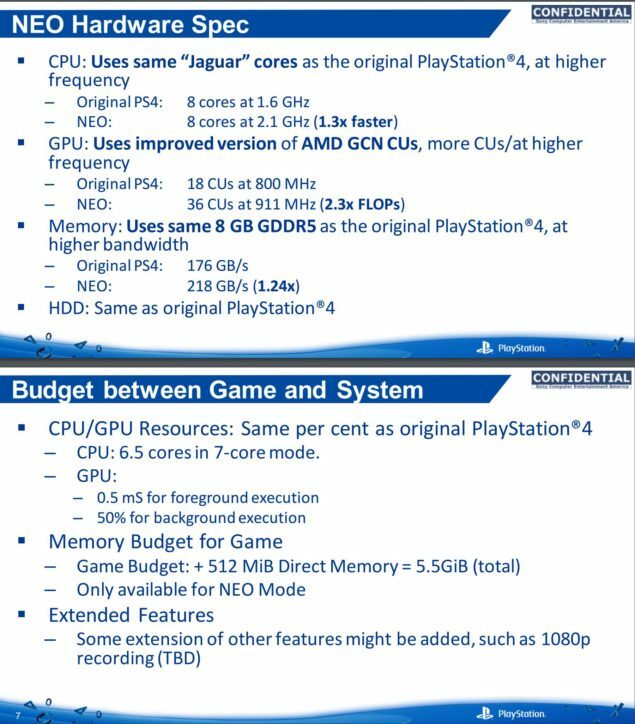 As Neo has 8GB of GDDR5 memory, it be faster – 218GB/s vs 176GB/s, just shy of 24% faster than the PS4’s memory. With these hardware changes people can play games with better performance and graphical fidelity. 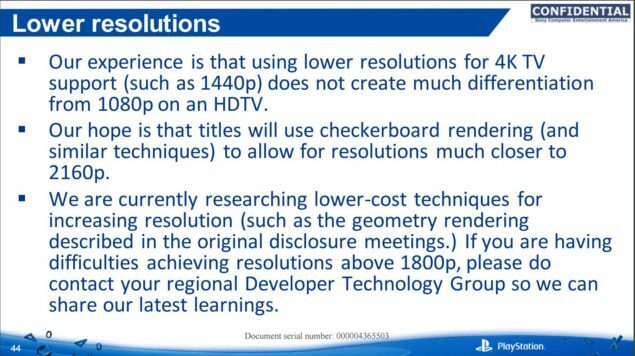 One more thing that PS4 Neo also supports 4K resolution already mentioned above and virtual reality. Sony makes this product to fitting with their new products like 4K televisions and PlayStation VR handset. 4K refers to pixel resolutions of 3,840 × 2,160, which offers four times as many pixels as a typical 1080p display. 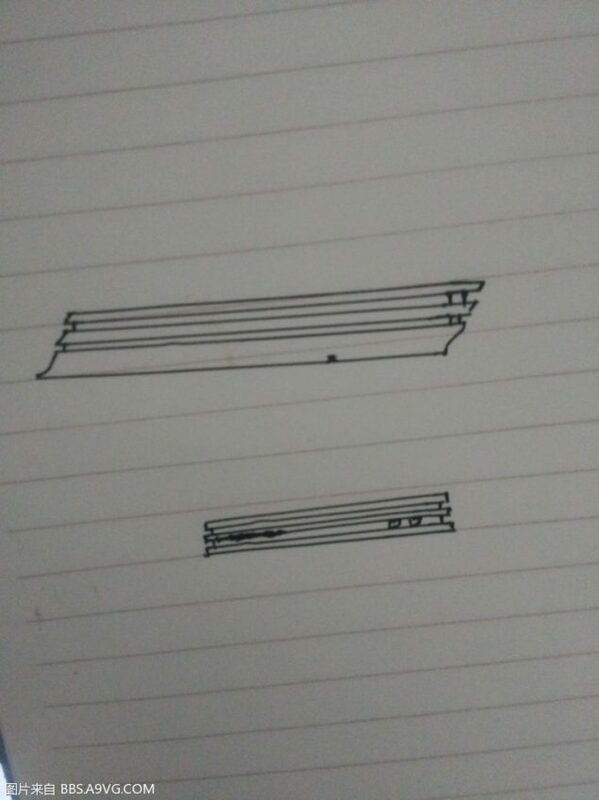 Check out the following leaked presentation shared by wccftech. The WCCF Tech leakes the sketch of the new gaming console Playstation 4 Neo. Playstation 4 Neo is more like a fine combination of the 2 past consoles that are PS2 and PS4. 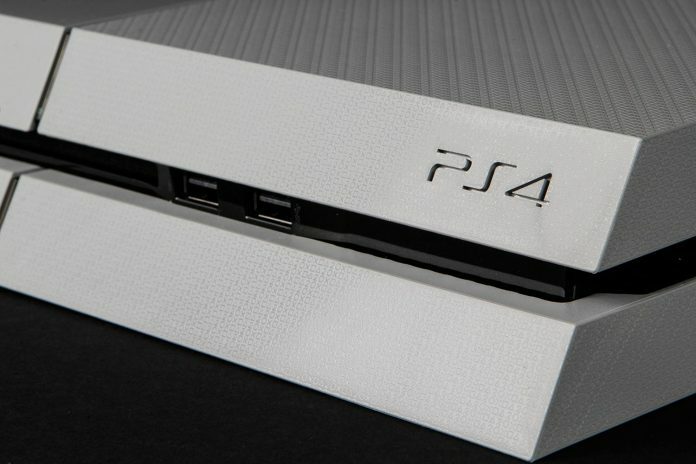 As design reported PS 4 Neo is thicker and heavier with an upgraded performance. The previewed sketch image of PS4 Neo was from Foxconn, the biggest electronics company who also behind the manufacturing of Microsoft Xbox and Apple devices. Sony’s PS4 Neo (or named as PS4.5 OR PS4K) also plays games published for the previous PS4. With the specifications like Jaguar 8 cores CPU runs at 2.1Ghz, a new GPU that runs at 911Mhz and 8Gb RAM, the PS4 Neo delivers the highest resolution for best gaming experience.